This weekend our dear friends Justin and Amy came over for dinner and I wanted to prepare something special. I was wracking my brain for a few days trying to come up with an idea, then one day on the drive home from work I heard a piece on NPR about a recipe for stuffed pumpkin. The original recipe called for pumpkin stuffed with breadcrumbs, bacon, and cheese, topped with heavy cream and nutmeg and baked in the oven. This sounded pretty amazing so I wanted to make my own interpretation. 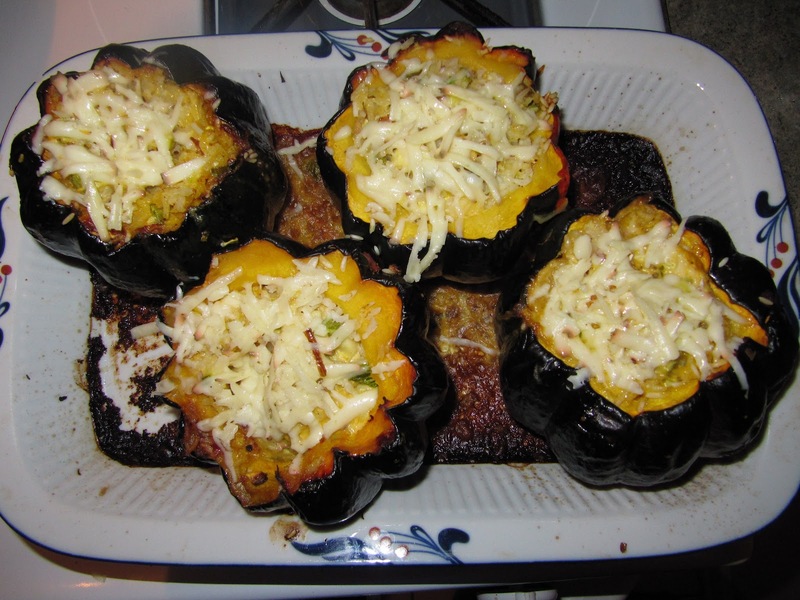 For my version I utilized acorn squash, they were the perfect size for individual servings. Since in my last post I did a recipe for stuffed calabacita, I decided to use this as the stuffing for my squash, along with rice and manchego cheese. 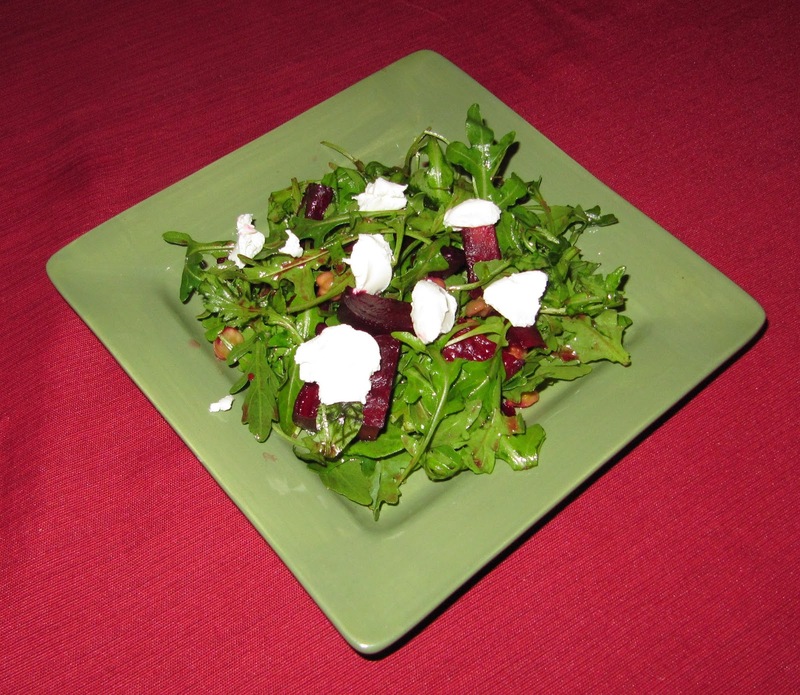 To serve along with the pumpkin I prepared an arugula salad with roasted beets, roasted fresh chick peas and goat cheese. To prepare the squash I first took 4 fresh acorn squash and sliced a tiny bit off the bottom, making sure not to cut through to the cavity of the squash, so that they can stand upright. I then proceeded to cut the tops off the squash to create an opening to the inner cavity. Using a spoon I gutted the squash, taking out all the seeds and fibrous material to prepare it for the stuffing. The stuffing consisted of diced calabacita, rice, manchego cheese, knob onions and garlic. I tossed all these ingredients in a bowl with salt and pepper and stuffed into the squash. I filled the squash with a combination of heavy cream, vegetable broth that I reduced by half and nutmeg. This serves as the liquid base which will cook through the rice as well as make for a rich flavorful stuffing. 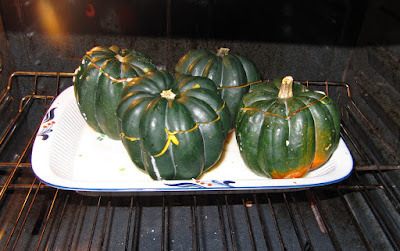 I covered the squash with their respective tops in the oven for 3 hours until the squash cooked through and the majority of the liquid was absorbed. I removed from the oven, sprinkled shredded manchego cheese over the top and placed back in the oven for another 15 minutes until the cheese was melted and golden brown. 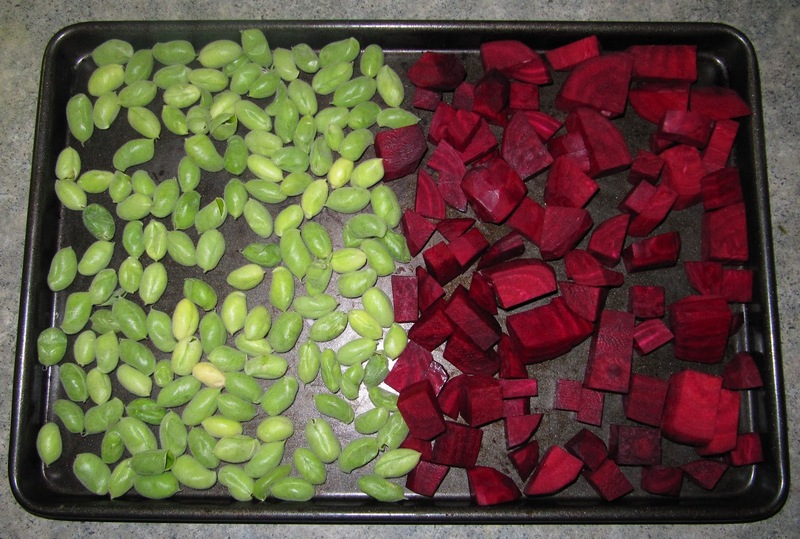 For the arugula salad, I began by preparing the vegetables. At my local produce market, I found some fresh chick peas. 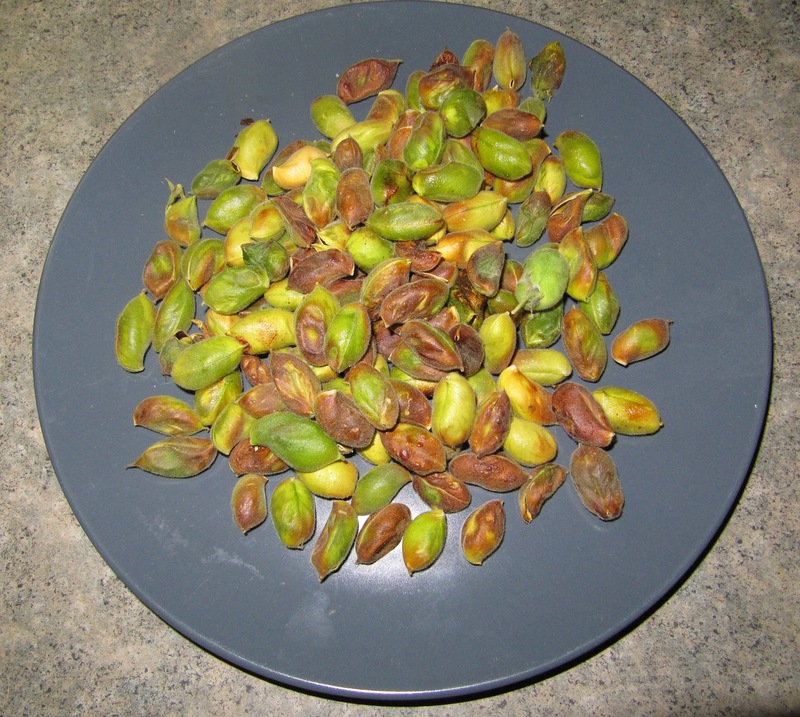 I never worked with these before but I had heard that you can roast them and they that they have a rich nutty flavor, somewhat similar to edamame. 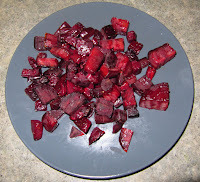 I also purchased some beets which I peeled and chopped before placing on a baking sheet with the chick peas (shell on) to roast. I roasted both vegetables in the oven for about 45minutes, occasionally moving the chick peas to make sure they don’t burn on one end. 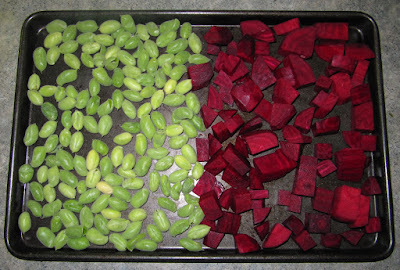 chickpeas and beets, together at last! 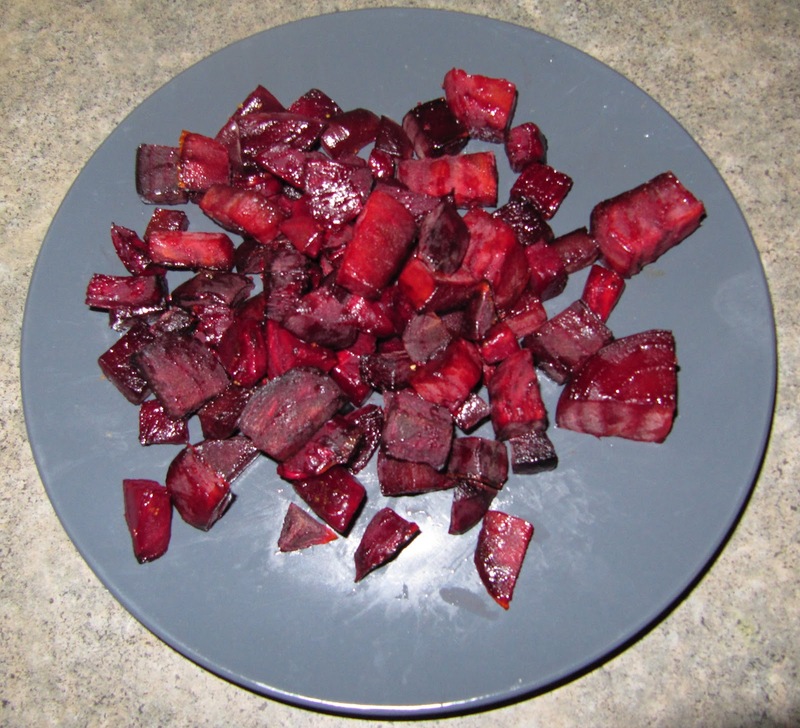 Once the vegetables cooled, I shelled the chick peas and I combined them along with the beets in a large bowl. I added a few handfuls of arugula and I tossed the salad in a simple vinaigrette I prepared with lemon, honey and olive oil. 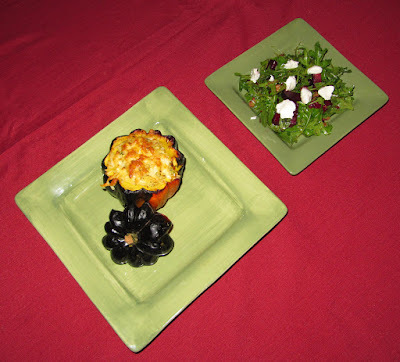 I served the salad on individual plates and topped with goat cheese. 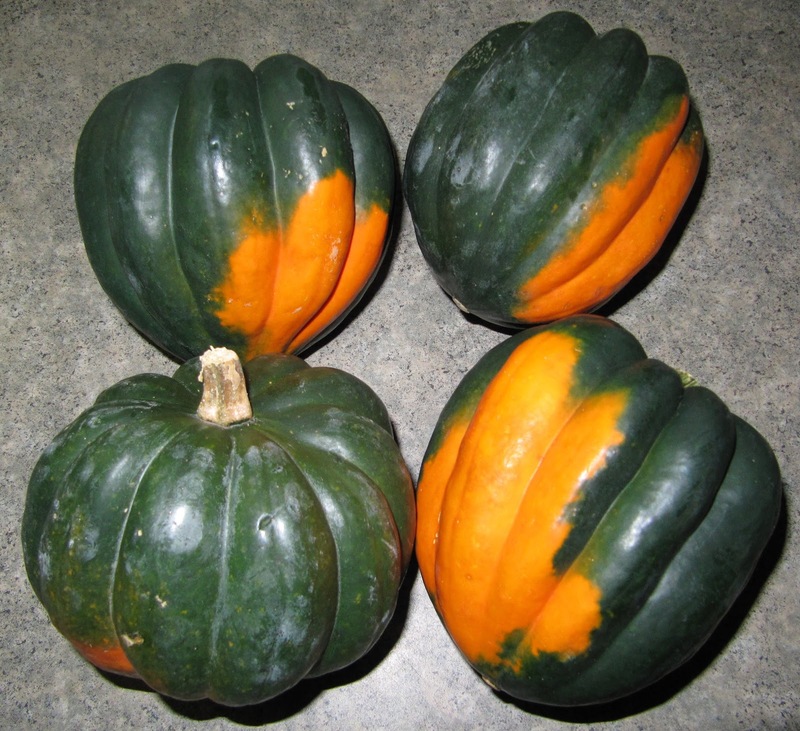 The squash was the perfect warming, comforting dish for our cozy dinner together. The stuffing was rich, creamy and the rice cooked through quite nicely. The squash went well with stuffing and the nutmeg tied all the flavors together. Despite the 3 hours in the oven, the dish overall is fairly easy to make and the results are well worth the wait. 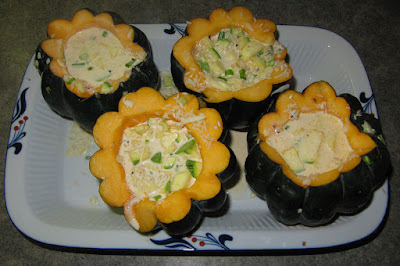 The salad was a nice addition to break up the richness of the squash dish. The chickpeas added a bit of texture and nuttiness that went well with the beets and goat cheese while the arugula and lemon vinaigrette added a bit of freshness and bite. We had a great night with our friends filled with interesting conversation and plenty of laughter. I feel truly honored to be able to cook for my friends, have a few beers and spend a wonderful evening together. Any time you want to have us over for dinner we'd love to be an excuse for another post. Seriously, that was a delightful meal.